WASHINGTON, D.C. -- The percentage of U.S. adults without health insurance was essentially unchanged in the fourth quarter of 2017, at 12.2%, but it is up 1.3 percentage points from the record low of 10.9% found in the last quarter of 2016. The 1.3-point increase in the uninsured rate during 2017 is the largest single-year increase Gallup and Sharecare have measured since beginning to track the rate in 2008, including the period before the Affordable Care Act (ACA) went into effect. That 1.3 point increase represents an estimated 3.2 million Americans who entered the ranks of the uninsured in 2017. 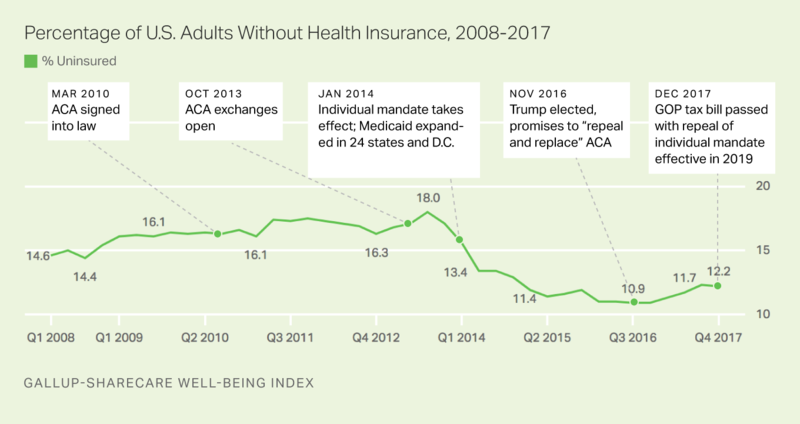 Despite the uninsured rate rising in 2017, it remains well below its peak of 18.0% measured in the third quarter of 2013, prior to the implementation of the ACA's healthcare exchanges and the requirement that most adults have health insurance or be subject to a fine, commonly known as the individual mandate. Black and Hispanic adults saw a 2.3 and 2.2 point increase in their uninsured rate in 2017, respectively. By comparison, the uninsured rate for whites grew less than 1.0 point over that same period. The percentage of low-income adults without health insurance in 2017 rose 2.0 points, while middle- and high-income Americans' saw their uninsured rates increase by 1.4 and 0.8 points, respectively. Gallup and Sharecare also track the ways in which Americans aged 18 to 64 (those who are not eligible for Medicare) obtain their health insurance -- whether that be through an employer, union, the government or a direct purchase from an insurance company. This decline in the percentage of Americans who pay for their own coverage marks a reversal of the trend seen since the ACA's individual mandate took effect in the third quarter of 2013. Between then and 2016, the percentage of adults with coverage via self-paid plans had grown 3.7 points. Gallup and Sharecare began asking Americans about the source of their health insurance using the current question wording in August 2013 in anticipation of shifts in how people would receive their health insurance after the healthcare exchanges opened. Gallup asks Americans, "Is your primary health insurance coverage through a current or former employer, a union, Medicare, Medicaid, military or veteran's coverage, or a plan fully paid for by you or a family member?" Gallup also asks respondents whether they have secondary health insurance coverage and, if so, what type of coverage it is. These results reflect those combined responses of primary and secondary insurance types. However, it seems likely that the uninsured rate will rise further in the years ahead. President Donald Trump signed a tax bill into law in December that included a repeal of the individual mandate. Without this requirement to have health insurance, it is likely that some Americans will drop their coverage. Rising insurance premiums, which are expected to continue to increase, could also result in some Americans forgoing health coverage. Young adults will be most likely to go without health coverage, meaning that they will no longer help offset the costs of older, less healthy adults -- which will drive up premiums even more. Having passed their tax bill, congressional Republicans' 2018 legislative goals include reforming funding mechanisms for Medicaid and Medicare -- programs that subsidize healthcare coverage for low-income, disabled and elderly Americans. With less federal assistance from these programs to help offset the rising cost of health insurance, fewer Americans may be able to afford health insurance. Help employees lead a life well-lived. Gallup can help you create a comprehensive well-being strategy to change lives and improve business performance. Create more than a wellness program, create a true culture of well-being. Develop a comprehensive program that improves employees' lives and business outcomes. Gallup editors highlight the most important health and well-being discoveries from the Gallup-Sharecare Well-Being Index in 2017.